After an accidental fire destroyed the entire building in 2009, a long rebuilding process followed. Rising from the ashes like the phoenix, the Graduate Bar and Restaurant was re-developed and fully restored, and has now regained it’s place at the heart of community in South Dublin. The Graduate has always had a great connection with the local community ever since it opened it’s doors. 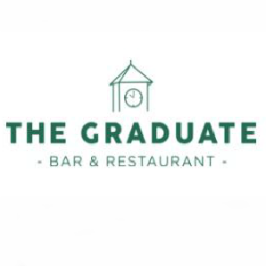 Nestled at the roundabout on Rochestown Ave, The Graduate is a leading Southside Bar and high quality Restaurant. The Graduate presents you with three individual open plan areas for meeting family and friends for a couple of drinks and/or an excellent dining experience. Service is efficient but discreet, cooking invariably excellent and The Graduate presents great value for money. We source the best of International boutique Beers, Wines and Spirits to compliment the style of cuisine and enhance your overall experience. See our menu. All sporting occasions – Rugby, Golf, Horseracing, Soccer, etc – are catered for on our wide range of screens throughout the entire bar and there is Live Music in the lounge bar every weekend. So why not call by for a few drinks or dine & stay on for the entertainment? You will not be disappointed!